Ask any Aussie rider for his or her first impression of Kiwi Adventure terrain and you are sure to get an earful about hills: steep hills, wet hills, mountainous hills. That’s right, compared to most places (OZ especially) the rider venturing off road in New Zealand is going to have to climb hills. For me, going uphill is easier than going down. I say that because given a bit of confidence from the rider and decent tyres, most dual purpose bikes, even the big ones can climb well. The good thing about going uphill is that if it all goes wrong you only have to shut the throttle the bike will stop almost immediately. Going back down? Now that’s another story, for another day. 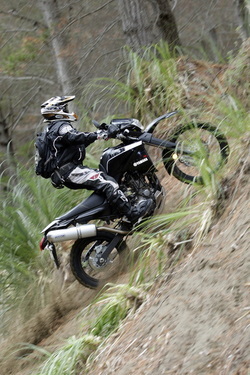 Meanwhile, let’s look at hill climbing techniques for the Adventure rider, in more detail. Momentum: Momentum (the impetus of a moving body) is vital for climbing hills. Carry as much momentum as you can into the hill. Once you have that momentum, do everything possible to keep it. Look ahead, make a plan: Look well ahead to pick your line, it’s natural to focus on the immediate problems in front of your wheel, but you need to be looking and planning much further ahead. The old road riding adage ‘you go where you look is also true for off road situations. Don’t be a lemming: Most riders will just churn into a situation without thinking. Look for alternatives, are there better lines to the sides? If you do get stuck go back down for a second go, or haul your bike out to better ground and start afresh – pushing is last resort. Retain control: Vital as momentum is, you also need to be in control, with your back wheel on the ground and driving. Standing up, using your legs as extra springs will help and free your body to move around the bike. Control of traction (from minimal to maximum wheel spin) will then come from a combination of throttle and clutch control and body position. The vital zones: The most critical zones of a hill are immediately before the climb, and the first real slope of the climb. In the first zone you gain momentum, the second zone is where you need to maintain and control that momentum. What gear? Most Adventure bikes climb best in second gear, though some, especially the bigger models, have tall first gears that equate to about second gear on smaller capacity machines. You need to select the gear that can give enough speed to maintain adequate momentum in the mid range of the engine’s power. Too slow and your momentum won’t be enough to climb, too fast and you will be unable to maintain control over bumps or cross ruts. Changing up or down a gear can be difficult once you are started, so hills are usually topped in the gear you hit the slope in. Clutch and rpm : Use the engine’s mid-range so you can increase or reduce throttle as you need. Constantly shadow the clutch. If you are thrown off line or need to slow, smooth clutch control will allow you to maintain drive and hold the gear you require. Some quick clutch work will keep the engine at maximum power for loose or wet hills. Traction or wheelspin? Some hills are conquered with blazing aggression and wheel spin, but most are scaled quietly with perfect traction, applying the right technique for the conditions. Sand, deep loam, pumice: Feet on the pegs and use plenty of revs and throttle to blast your way up in second gear. Slip the clutch to keep engine revs up. Sticky clay: Plenty of speed keeps the tyre clean and biting. Use first, or second gear if you can, with plenty of revs - be ready to slip the clutch to keep engine revs up. Maintain momentum and control by standing, and use only one foot at a time to maintain balance and direction. Grass: Climb smooth grassy hills successfully with momentum, sitting, using second gear and smooth application of throttle. For rough grass a standing position will allow you to work your knees through the bumps and maintain rear wheel drive. When wet, get your weight further back to give consistent drive. Ruts: Rain ruts are common on all hills. Ride out of the ruts and to avoid being sucked in try not to spin the rear tyre. Jump ruts from side to side if the ruts twist. If caught in a rut try keep at least one foot on the peg and keep as much momentum as you can. If you can’t balance, get those legs paddling strongly and maintain momentum at all costs. Loose rocky climbs: Aggression will not work on uneven sized rubble or rolling rocks. Spinning your rear tyre will just get rocks rolling and the rear wheel bouncing. Pick the straightest, smoothest line. Use first or second gear and get all the momentum you can early. Crouch on the footpegs, weight well back to the rear, using your legs as extra suspension to soften the effect of the rocks on the rear tyre. Back the power off as required to maintain grip. Hard slippery clay or smooth wet rock: Don’t rush, stay relaxed, crouching on the pegs with your weight well to the rear. Make your approach as straight as possible and lean to keep the wheels upright to the surface. Use low revs in first or second gear and aim for zero wheelspin. Commitment: Climbing hills is more than just positive thinking, but it certainly helps. Use you head, make a plan - and deal to the bugger!